The ends of a line are points. A surface is that which has length and breadth only. The edges of a surface are lines. A plane surface is a surface which lies evenly with the straight lines on itself. A plane angle is the inclination to one another of two lines in a plane which meet one another and do not lie in a straight line. When a straight line standing on a straight line makes the adjacent angles equal to one another, each of the equal angles is right, and the straight line standing on the other is called a perpendicular to that on which it stands. An obtuse angle is an angle greater than a right angle. An acute angle is an angle less than a right angle. A boundary is that which is an extremity of anything. A figure is that which is contained by any boundary or boundaries. A circle is a plane figure contained by one line such that all the straight lines falling upon it from one point among those lying within the figure equal one another. And the point is called the center of the circle. A diameter of the circle is any straight line drawn through the center and terminated in both directions by the circumference of the circle, and such a straight line also bisects the circle. A semicircle is the figure contained by the diameter and the circumference cut off by it. And the center of the semicircle is the same as that of the circle. Rectilinear figures are those which are contained by straight lines, trilateral figures being those contained by three, quadrilateral those contained by four, and multilateral those contained by more than four straight lines. Of trilateral figures, an equilateral triangle is that which has its three sides equal, an isosceles triangle that which has two of its sides alone equal, and a scalene triangle that which has its three sides unequal. Further, of trilateral figures, a right-angled triangle is that which has a right angle, an obtuse-angled triangle that which has an obtuse angle, and an acute-angled triangle that which has its three angles acute. Parallel straight lines are straight lines which, being in the same plane and being produced indefinitely in both directions, do not meet one another in either direction. A unit is that by virtue of which each of the things that exist is called one. A number is a multitude composed of units. But parts when it does not measure it. The greater number is a multiple of the less when it is measured by the less. An even number is that which is divisible into two equal parts. An odd number is that which is not divisible into two equal parts, or that which differs by a unit from an even number. An even-times-even number is that which is measured by an even number according to an even number. An even-times-odd number is that which is measured by an even number according to an odd number. An odd-times-odd number is that which is measured by an odd number according to an odd number. A prime number is that which is measured by a unit alone. Numbers relatively prime are those which are measured by a unit alone as a common measure. A composite number is that which is measured by some number. Numbers relatively composite are those which are measured by some number as a common measure. A number is said to multiply a number when the latter is added as many times as there are units in the former. And, when two numbers having multiplied one another make some number, the number so produced be called plane, and its sides are the numbers which have multiplied one another. And, when three numbers having multiplied one another make some number, the number so produced be called solid, and its sides are the numbers which have multiplied one another. A square number is equal multiplied by equal, or a number which is contained by two equal numbers. And a cube is equal multiplied by equal and again by equal, or a number which is contained by three equal numbers. Numbers are proportional when the first is the same multiple, or the same part, or the same parts, of the second that the third is of the fourth. Similar plane and solid numbers are those which have their sides proportional. A perfect number is that which is equal to the sum its own parts. If there are as many numbers as we please in continued proportion, and the extremes of them are relatively prime, then the numbers are the least of those which have the same ratio with them. To find as many numbers as are prescribed in continued proportion, and the least that are in a given ratio. Corollary. If three numbers in continued proportion are the least of those which have the same ratio with them, then the extremes are squares, and, if four numbers, cubes. If as many numbers as we please in continued proportion are the least of those which have the same ratio with them, then the extremes of them are relatively prime. If there are as many numbers as we please in continued proportion, and the first does not measure the second, then neither does any other measure any other. If there are as many numbers as we please in continued proportion, and the first measures the last, then it also measures the second. If between two numbers there fall numbers in continued proportion with them, then, however many numbers fall between them in continued proportion, so many also fall in continued proportion between the numbers which have the same ratios with the original numbers. If two numbers are relatively prime, and numbers fall between them in continued proportion, then, however many numbers fall between them in continued proportion, so many also fall between each of them and a unit in continued proportion. If numbers fall between two numbers and a unit in continued proportion, then however many numbers fall between each of them and a unit in continued proportion, so many also fall between the numbers themselves in continued proportion. Between two square numbers there is one mean proportional number, and the square has to the square the duplicate ratio of that which the side has to the side. Between two cubic numbers there are two mean proportional numbers, and the cube has to the cube the triplicate ratio of that which the side has to the side. If there are as many numbers as we please in continued proportion, and each multiplied by itself makes some number, then the products are proportional; and, if the original numbers multiplied by the products make certain numbers, then the latter are also proportional. If a square measures a square, then the side also measures the side; and, if the side measures the side, then the square also measures the square. If a cubic number measures a cubic number, then the side also measures the side; and, if the side measures the side, then the cube also measures the cube. If a square does not measure a square, then neither does the side measure the side; and, if the side does not measure the side, then neither does the square measure the square. If a cubic number does not measure a cubic number, then neither does the side measure the side; and, if the side does not measure the side, then neither does the cube measure the cube. Between two similar plane numbers there is one mean proportional number, and the plane number has to the plane number the ratio duplicate of that which the corresponding side has to the corresponding side. Between two similar solid numbers there fall two mean proportional numbers, and the solid number has to the solid number the ratio triplicate of that which the corresponding side has to the corresponding side. If one mean proportional number falls between two numbers, then the numbers are similar plane numbers. If two mean proportional numbers fall between two numbers, then the numbers are similar solid numbers. If three numbers are in continued proportion, and the first is square, then the third is also square. If four numbers are in continued proportion, and the first is a cube, then the fourth is also a cube. If two numbers have to one another the ratio which a square number has to a square number, and the first is square, then the second is also a square. If two numbers have to one another the ratio which a cubic number has to a cubic number, and the first is a cube, then the second is also a cube. Similar solid numbers have to one another the ratio which a cubic number has to a cubic number. If two similar plane numbers multiplied by one another make some number, then the product is square. If two numbers multiplied by one another make a square number, then they are similar plane numbers. If a cubic number multiplied by itself makes some number, then the product is a cube. If a cubic number multiplied by a cubic number makes some number, then the product is a cube. If a cubic number multiplied by any number makes a cubic number, then the multiplied number is also cubic. If a number multiplied by itself makes a cubic number, then it itself is also cubic. If a composite number multiplied by any number makes some number, then the product is solid. If as many numbers as we please beginning from a unit are in continued proportion, then the third from the unit is square as are also those which successively leave out one, the fourth is cubic as are also all those which leave out two, and the seventh is at once cubic and square are also those which leave out five. If as many numbers as we please beginning from a unit are in continued proportion, and the number after the unit is square, then all the rest are also square; and if the number after the unit is cubic, then all the rest are also cubic. If as many numbers as we please beginning from a unit are in continued proportion, and the number after the unit is not square, then neither is any other square except the third from the unit and all those which leave out one; and, if the number after the unit is not cubic, then neither is any other cubic except the fourth from the unit and all those which leave out two. If as many numbers as we please beginning from a unit are in continued proportion, then the less measures the greater according to some one of the numbers which appear among the proportional numbers. Corollary. Whatever place the measuring number has, reckoned from the unit, the same place also has the number according to which it measures, reckoned from the number measured, in the direction of the number before it. If as many numbers as we please beginning from a unit are in continued proportion, then by whatever prime numbers the last is measured, the next to the unit is also measured by the same. If as many numbers as we please beginning from a unit are in continued proportion, and the number after the unit is prime, then the greatest is not measured by any except those which have a place among the proportional numbers. If a number is the least that is measured by prime numbers, then it is not measured by any other prime number except those originally measuring it. If three numbers in continued proportion are the least of those which have the same ratio with them, then the sum of any two is relatively prime to the remaining number. If two numbers are relatively prime, then the second is not to any other number as the first is to the second. If there are as many numbers as we please in continued proportion, and the extremes of them are relatively prime, then the last is not to any other number as the first is to the second. Given three numbers, to investigate when it is possible to find a fourth proportional to them. If as many even numbers as we please are added together, then the sum is even. If as many odd numbers as we please are added together, and their multitude is even, then the sum is even. If as many odd numbers as we please are added together, and their multitude is odd, then the sum is also odd. If an even number is subtracted from an even number, then the remainder is even. If an odd number is subtracted from an even number, then the remainder is odd. If an odd number is subtracted from an odd number, then the remainder is even. If an even number is subtracted from an odd number, then the remainder is odd. If an odd number is multiplied by an even number, then the product is even. If an odd number is multiplied by an odd number, then the product is odd. If an odd number measures an even number, then it also measures half of it. If an odd number is relatively prime to any number, then it is also relatively prime to double it. If a number has its half odd, then it is even-times odd only. If an [even] number neither is one of those which is continually doubled from a dyad, nor has its half odd, then it is both even-times even and even-times odd. If as many numbers as we please are in continued proportion, and there is subtracted from the second and the last numbers equal to the first, then the excess of the second is to the first as the excess of the last is to the sum of all those before it. 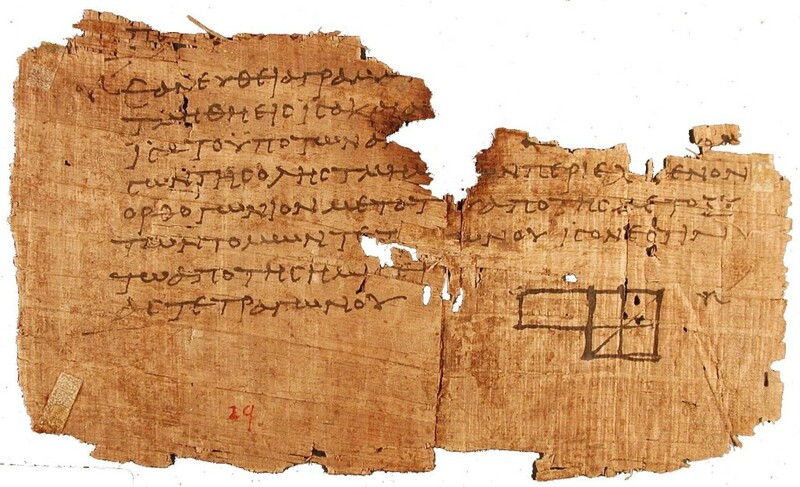 †The propositions contained in Books 7–9 are generally attributed to the school of Pythagoras.